Sydney is known for nightlife, trails, beaches, parks, and museums. 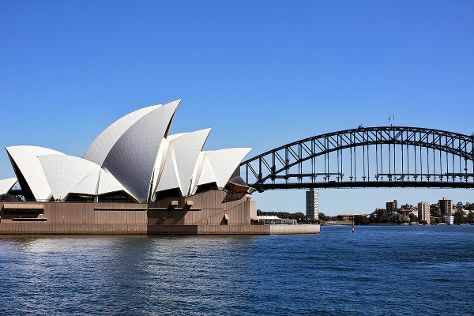 Your plan includes some of its best attractions: catch a live performance at Sydney Opera House, admire nature's wide array of creatures at Sea Life Sydney Aquarium, appreciate the history behind Mrs Macquarie's Chair, and snap pictures at Sydney Harbour Bridge. For reviews, traveler tips, ratings, and more tourist information, you can read our Sydney trip app . Austin, USA to Sydney is an approximately 22-hour flight. You can also do a combination of bus and flight; or do a combination of flight and train. The time zone difference when traveling from Austin to Sydney is 16 hours. Expect much colder temperatures when traveling from Austin in August; daily highs in Sydney reach 66°F and lows reach 49°F. Finish your sightseeing early on the 11th (Sun) so you can travel to Melbourne. Melbourne is known for museums, shopping, parks, zoos & aquariums, and nightlife. Your plan includes some of its best attractions: admire the natural beauty at Royal Botanic Gardens, admire nature's wide array of creatures at Melbourne Zoo, get your game on at Zero Latency, and see the interesting displays at Melbourne Museum. To find photos, other places to visit, maps, and more tourist information, you can read our Melbourne online itinerary builder . You can fly from Sydney to Melbourne in 3.5 hours. Alternatively, you can do a combination of flight and shuttle; or drive. Plan for a bit cooler temperatures traveling from Sydney in August, with highs in Melbourne at 57°F and lows at 42°F. Wrap up your sightseeing on the 14th (Wed) to allow time to travel to Cairns. On the 15th (Thu), identify plant and animal life at Wildlife Areas. Get ready for a full day of sightseeing on the 16th (Fri): admire the natural beauty at Botanical Gardens, tour the pleasant surroundings at Esplanade Boardwalk, and then stroll through Anzac Park. To find maps, more things to do, and more tourist information, read Cairns travel site . Fly from Melbourne to Cairns in 6 hours. Alternatively, you can drive; or take a train. Traveling from Melbourne in August, things will get much warmer in Cairns: highs are around 80°F and lows about 63°F. Cap off your sightseeing on the 16th (Fri) early enough to travel back home.